London and New York, New York and London: two global capitals bursting with wealth, prestige and cultural dynamism, they’re unquestionably twinned at the top of any list of the world’s most marvellous cities. London is a richly diverse, open-doored metropolis, the throbbing heart of England and beyond which owes its thriving existence to no particular group. New York mirrors it as a cultural beacon of the western world: a cosmopolitan hub for musicians and misfits, beaming the promise of success as unbounded as its soaring skyscrapers into the collective psyche of aspirants across the globe. But while many dream of making these cities their homes, populations exceeding eight million apiece are brimming over, making these urban jungles incredibly hectic. Whether crowds are a blessing for those seeking anonymity or a curse for the hurried masses, they’re simply unavoidable here – meaning these cities can be enticing but risky places to ride a bicycle. And so this is what crosses my mind as I look out over the bright lights of Manhattan from the rooftop of my apartment on my first evening here. 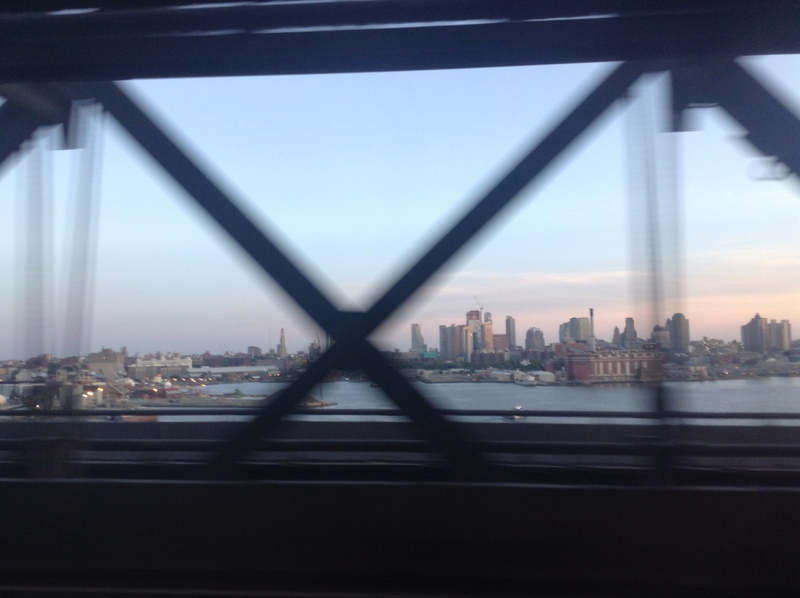 I find myself – an Englishwoman, a Londoner – in New York for three weeks, part of a five-month travel stint which has taken me to many other large cities in the Americas. Yet New York stands out as a particularly enthralling location; it’s the natural counterpart, and therefore rival, to my beloved London. And I’ll be exploring it by bicycle. I have my own bike in London, but used public Boris bike equivalents in New York. My own affection for bicycles started around two years ago and they’re now my constant companions in the capital, where I studied as an undergraduate and now as a graduate. It was mid-2013 and I had returned from a six-month exchange in a small Californian university town where students make up a significant percentage of the population, and where having a bike on campus was an indispensable component of the chilled-out SoCal culture. Cycling from class to class under the west coast sun was a breeze – nobody wore a helmet, the pace was slow and steady; there was even a bicycle fixer-upper on campus, so you never had to go far to pump your tyres. Obviously, London is somewhat different. But upon my return I vowed to keep cycling. 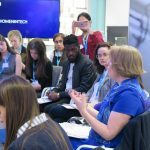 I’d never taken it seriously as an option before, having been fortunate enough to live in student accommodation within walking distance of my university, and the dangers of traffic and the bad winter weather were also mental barriers. However, it’s safe to say that despite thefts, rain and endless punctures, I’ve never looked back since getting my first bike (a freebie from a local FreeCycle branch). Taking on the unforgiving streets was daunting at first – it’s noisy, scary and can be claustrophobic – but as long as you’re careful, cycling is, in my opinion, the best way to get around. London can be tough on icy winter days, but cycling has given me an unrivalled independence and self-sufficiency which public transport simply cannot provide, especially at rush hour. It’s good for physical fitness, and is infinitely cheaper than using buses or the tube. Paying £2.70 for the privilege of squeezing onto a heaving Northern Line train at 7:30am? No thanks – I’ll stick with the wheels. Perhaps the best thing about cycling, though, is the freedom. There’s no need to face the limitations of public transport; rather than having to walk fifteen minutes to the right bus stop, my trusty steed takes me door-to-door. I’ve learned so much about London’s geography and complex transport network from getting lost in the oldest parts of town, navigating at night with the Thames as my compass, and being shouted at by irritated drivers as I wheel unwittingly down a one-way street. Come summer, there’s little better than zooming down York Way against the wind, attending critical mass, or spending a sunny day exploring the Lea Valley and the East End docks. Such is my unwillingness to be separated from the saddle, I even took part in the London leg of the World Naked Bike Ride last year, an annual strip-down which sees thousands of inhabitants don their birthday suits and ride through the streets in protest against excessive petrol consumption. New York and other cities across the world also play host to this event each year, and it’s a blast. The World Naked Bike Ride sees thousands take to the streets each year, starkers. In fact I think neither bustling London nor crowd-crazy New York can be considered hostile to cyclists. History, too, would say otherwise: America’s very first bike path opened in Brooklyn in 1894, with London’s first segregated bicycle lane following suit in 1934. Cycling has been, at least for the past century, an integral activity for a modest proportion of residents of both New York and London – even if cyclists have had to fight to make their safety a priority for transport ministers. 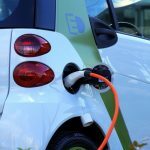 But things are improving on both sides of the Atlantic, and the tides have changed even more drastically in recent years, with bicycles securing their place as a legitimate and popular mode of transport in the UK capital. I for one often feel that I’m more comfortable on two wheels than on two legs, and I’m not alone. Cycling in London, having already doubled in the past decade, is now at its highest since records began, and it’s a similar story in New York: 2014 was the most popular year for cycling since counts commenced in 1985. In fact, the U.S. Census Bureau found that between 2008-2012, 0.8% of its working population used a bicycle to travel to work – a significant increase from 0.5%, the figure in the year 2000. Across the pond, especially among commuters like me, the figure is even higher: the 2011 population census showed that more than 7% of Inner London residents who travel to work now travel by bicycle. Across London as a whole, 4.3% now travel by bike to work, up from 2.3% in 2001 – and this article from 2013 reports that bicycles account for a staggering 24% of vehicles during the city’s morning rush hour. Of 12 cities surveyed across the world, London also logs the most cycle journeys by far – 7 million over the past 12 months, according to statistics gathered recently by Strava Insights. That’s miles ahead of its closest competitor, cycling haven Amsterdam, which logged 2.7 million. 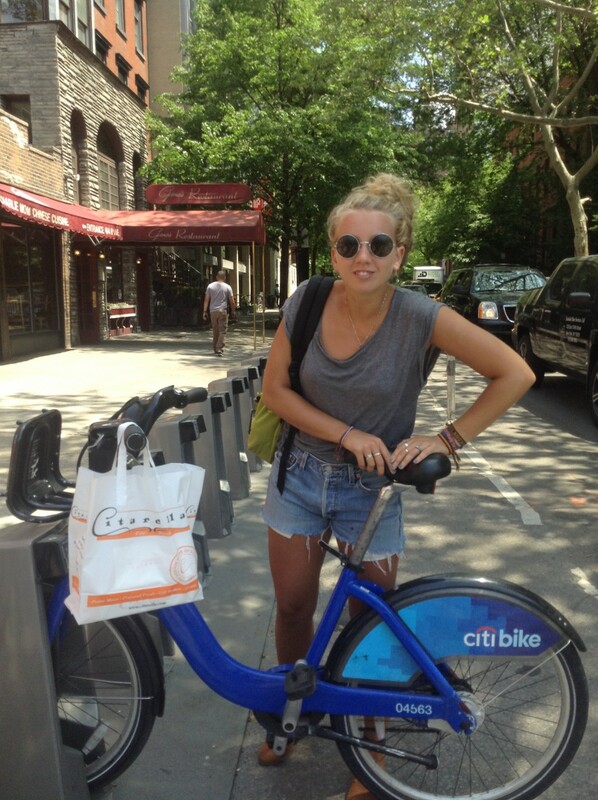 I’m not here long enough to consider buying a bike, so I decided to rent Boris bike equivalent Citi Bike. The models seem identical – they’re sturdy, heavy, reliable bicycles equipped with bells, ‘baskets’ with a useful bungee strap, and front and rear lights. Once I’d adjusted a Citi Bike to my liking, I decided to tackle Sixth Avenue, also known as Avenue of the Americas and one of New York’s busiest streets, by way of comparison to the nightmare that is Oxford Street at rush hour. Sixth Avenue, or Avenue of the Americas, cuts right through Manhattan and often has heavy traffic. 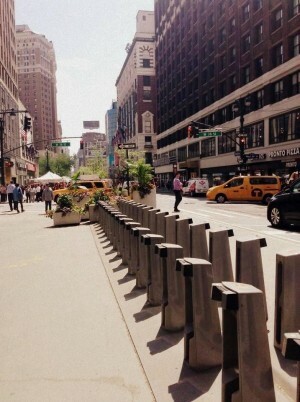 The Citi Bike scheme is well-used by New Yorkers. It was launched in May 2013 (three years after the London version), and the team behind it is thinking big: the aim is to double the bike fleet to 12,000 and bring the number of docking stations up to 375 within the next two years. They also want to expand it further into Brooklyn, Long Island City and upper Manhattan, because for now it only covers Manhattan south of Central Park and parts of western Brooklyn, which luckily was mostly adequate for my purposes. 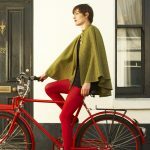 Londoners will be very familiar with our own version: London’s public bicycles, officially rebranded this year as Santander Cycles, have expanded with similar numbers. More than 10,000 of the iconic bikes are now available from over 700 docking stations, and you can find them in most parts of Inner London apart from the south-east. This is a response to genuine demand: public bicycles are popular in both London and New York, with Streetsblog writing in 2013 that Citi Bikes make up 30% of bicycle traffic, and Transport for London (TfL) reporting earlier this year that use of its Cycle Hire scheme has increased by 25% since 2013. Popular scheme: I found a lot of docks empty during daylight hours in Manhattan. 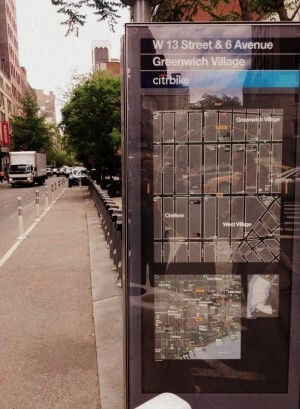 From my short time here, I can certainly advocate adding to the Citi Bikes fleet – I noticed that there are often frustratingly few bikes in busy areas such as Greenwich Village and Chelsea. Empty docks are a common sight, especially on the most summery days, and I found myself having to search for another one. Thankfully the Citi Bikes app, which shows you your nearest dock along with numbers of spaces/bicycles available, comes in handy at times like these (shockingly, London’s cycle hire scheme has only this year launched an official app). And to be honest, I’m happy to know that the bikes are being used; public bike hire has revolutionised the way people can travel in big cities. It’s worth noting that the Citi Bikes scheme is more expensive on a day-to-day basis than Santander Cycles. 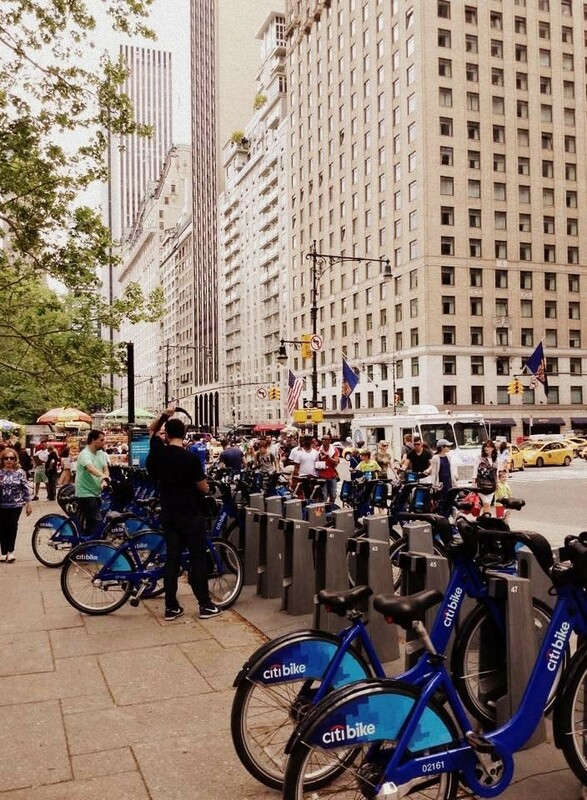 A single 24-hour period of bike hire costs just £2 in the UK capital, whereas hiring a Citi Bike will set you back $9.95 (excluding tax) – by today’s conversion rates, that’s around £6.33. Both charge nothing for the first 30 minutes of a journey, with additional costs incurred after this point. 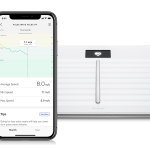 It’s much more cost-effective to become an annual member, however, costing almost exactly the same in both cities at £90 ($141.50) in London and $149 (£94.77) in New York. My first impression, as I ride north up one-way Sixth Avenue, is that New Yorkers on bikes seem to have a similar status to those in London: in sheer numbers, there’s quite an impressive amount of them on the streets, but they come bottom of the pile, unlike the vehicular hierarchy in somewhere like, say, Amsterdam, where cyclists are king of the road. Over the course of my time here, while I feel more and more at ease on the bicycle, I have become increasingly aware of my comparative smallness against the bulk of honking traffic surrounding me (the horn is used much more generously here). Going up Sixth, I stick to the bus lane where I can, although I’m only able to do that because it’s a Saturday: weekdays they’re reserved for buses only, unlike in London where cyclists are afforded a bit of extra protection by being permitted to share the less crowded bus lanes. 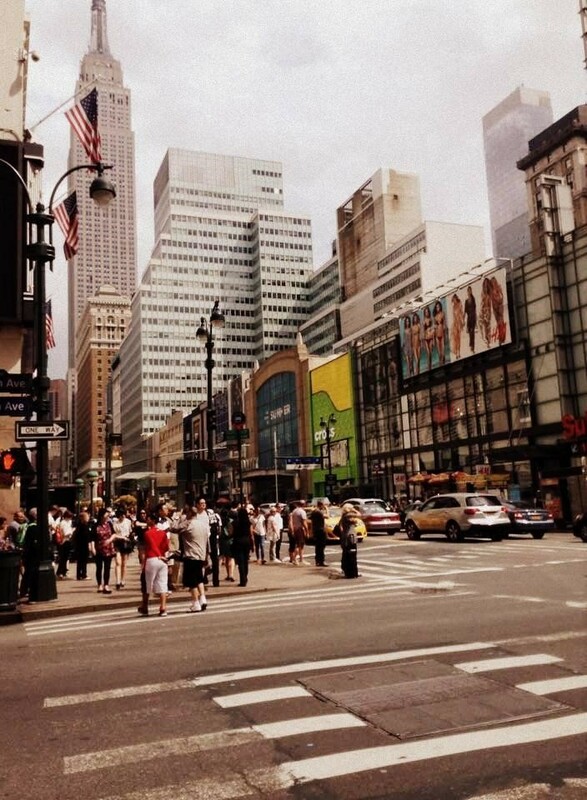 But I expected noise and reams of traffic – it’s New York City, duh! And it scores significant points on London for allowing greater cyclist visibility: the streets here might be known to be meaner, but they’re certainly broader, and that’s good news for those on two wheels. Finding yourself crushed between a bus and a truck would be harder here, although not impossible. The towering buildings draw the eye upwards and onwards, creating at the very least an illusion of more space; it’s a welcome break from the claustrophobic crush on a sweltering summer day on the narrow streets of London. 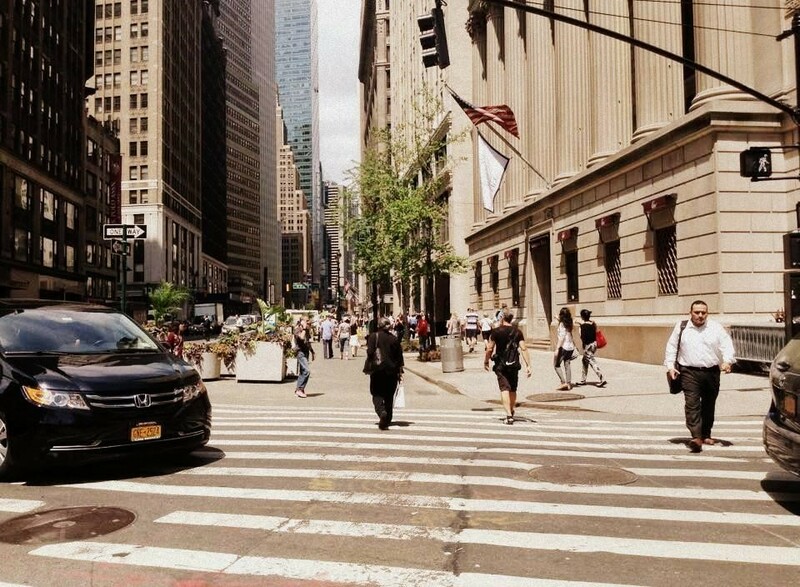 The streets are easy to handle in Manhattan, at least; the only major road which breaks the grid pattern is the infamous Broadway, originally a Native American pathway which cuts diagonally east to west through the city. 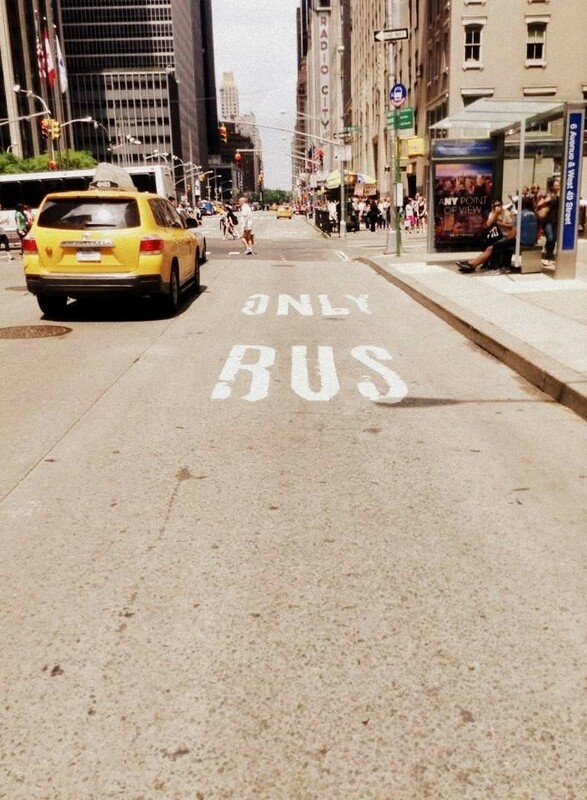 Bus lanes can only be shared by bicycles during evenings and weekends in NYC. That said, cycle lanes themselves seem to be in short supply. Although I did come across them, their functionality has been called into question: look no further than this brilliant video by New Yorker Casey Neistat, which went viral after he received a $50 fine from an NYPD officer in 2011 for not cycling in the designated pathway. My own experience has been similar – I breathe an inward sigh of relief once I reach a cycle lane, because surprisingly, a lot of big roads don’t have them (such as Seventh and Sixth Avenue). But it’s always short-lived, because a lane can just as suddenly turn into a death trap. Outside of the cycle lanes, road etiquette can seem non-existent: taxis swerve, pedestrians wander in front of you, car doors open with no notice, other cyclists are off in their own world listening to music, and NOBODY signals. Sometimes you’re left feeling like you need some kind of qualification in telepathy to handle it all. 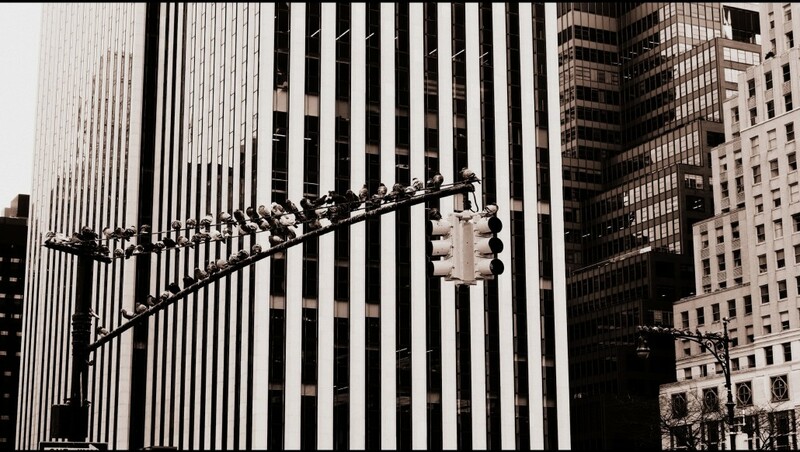 Like most states, New York allows drivers to make a turn on a red light in certain situations – typically if there is no sign prohibiting “right on red”, and if it is safe to do so under the circumstances. A right turn on red is prohibited when a red arrow is present. No right turn on red is permitted in New York City unless a sign permits. So all these people going through red lights might not be aware of the law in NYC. Equally, they could just be ignoring it. As the days go by, I can’t help feeling slightly bemused by the laissez-faire attitude to cycling here – after all, NYC is still a huge and busy city, with plenty of opportunities for accidents if you’re not paying attention. Every single day, incredulous, I witnessed other cyclists trundling along in the wrong direction on a one-way street – cool as cucumbers. I found myself facing down such rebels and keeping a special lookout for them. There also seems to be a bizarre absence of urgency when an ambulance comes roaring through. A couple of times I witnessed emergency vehicles attempting to navigate the busy main avenues, sirens blaring, only to be faced with a near-blockade of obstinate traffic. 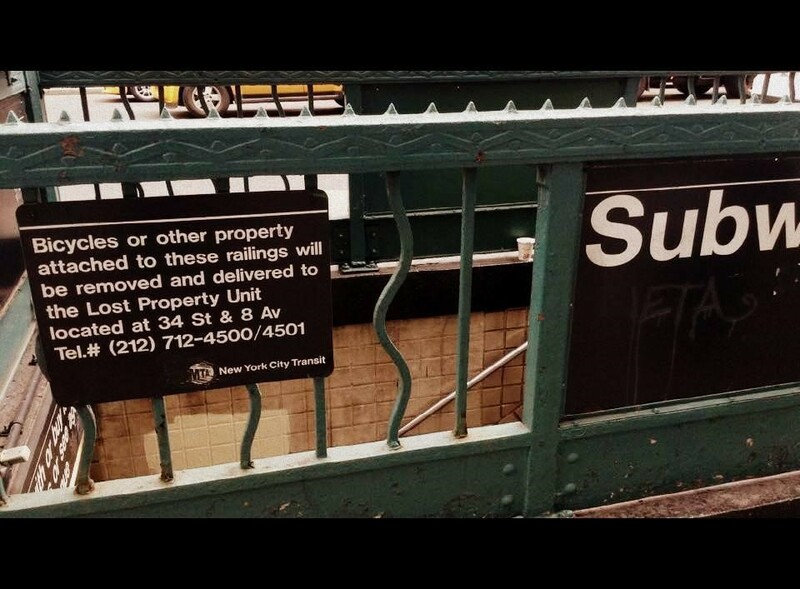 Someone’s dying, somewhere … But New York stops for no-one. Then again, I did notice “fire lanes” on some roads, which I assume are supposed to be for emergency vehicles. In London, by comparison, there’s no such thing; you’ll see an almost comic rush as panic-stricken drivers scramble to get out of the way at the first sound of a siren. Vehicles scatter like nervous sheep, cyclists mount the pavements, and lorries pull over with immediate effect. Something else which didn’t really cross my mind before I started on this project is the positioning of the traffic lights here. Swinging lazily above rows of vehicles, a shot from a million movie scenes, they can be quite enigmatic if you don’t know where to look. There were a couple of instances where I totally missed a red light because it evaded my line of vision; luckily I was going slowly enough to reverse back over the crossing. Another time, the opposite happened: I was slow to respond to a green because it was dangling so far over to the left. I have to admit, though, that the grid system makes all this erraticness easier to handle: there’s a certain satisfaction in wheeling up and down the main avenues, the user-friendly numerical streets going by as I progress from block to block, counting 12th, 11th, 10th, 9th … Commuting here must be a dream: it’s incredibly difficult to get lost, and if you do, re-orienting yourself would be a simple matter of finding out which numbers you’re sandwiched between. London presents an opposing challenge, because when taking a new route, it’s all too simple to become adrift in new lands with no point of reference. Because London, dear London, is an old city: try as they might to make it safer and more accessible (and they really are trying), TfL can only do so much with such an overcrowded palimpsest. New York’s history, by comparison, can be traced only to the 17th century – and it thus lends itself much more generously to a modern, fast-paced lifestyle which might involve speedy journeys, regular commutes at the busiest hours, and a teeming social life. Rather than having to meander through winding side-streets and up hills only to double back on yourself, as is often the case in London, cycling in Manhattan is a pretty straightforward process over mostly flat, well-tarmacked terrain. That said, I’d be lying if I didn’t admit that the frustration of navigating London’s tricky streets is also its thrill. I can choose three or four different routes home from work, for example, and each will show me entirely different scenery – this is something the monotony of the city grid cannot offer. I have stumbled upon such delights as Kentish Town City Farm and the Rose, a Victorian pub nestled on Snowsfields in Southwark, while taking alternative routes by accident. Also on my six-mile cycle into work, I get to pass one of my favourite little streets, Keystone Crescent in King’s Cross, a tiny, charming relic which throws you straight back to the Georgian era. There are few places like that in Manhattan – the grid system, though highly useful, is charmless and unimaginative by comparison to the organic-ness of London’s messy layout. That said, it would be unfair (and inaccurate) to suggest that a road system alone negates the presence of grace and mystery in New York City. During my cycling adventures, I came across some adorable areas quite by chance, as a result of the greater freedom and speed afforded me by using a bike. I took a turn off Sixth Avenue one gloriously sunny day and identified the quieter, less rigidly gridded streets of West Village, which permitted me a tranquil day of exploration; on the same evening, I encountered the Stonewall Inn, infamous for its riots in 1969 and a cherished emblem of the gay rights movement for this reason, where I stopped for a (very strong!) drink. On a different day, I discovered the High Line – an unexpectedly lovely park created in 2009 out of an elevated, disused portion of railway track – when nosing around the Meatpacking District. 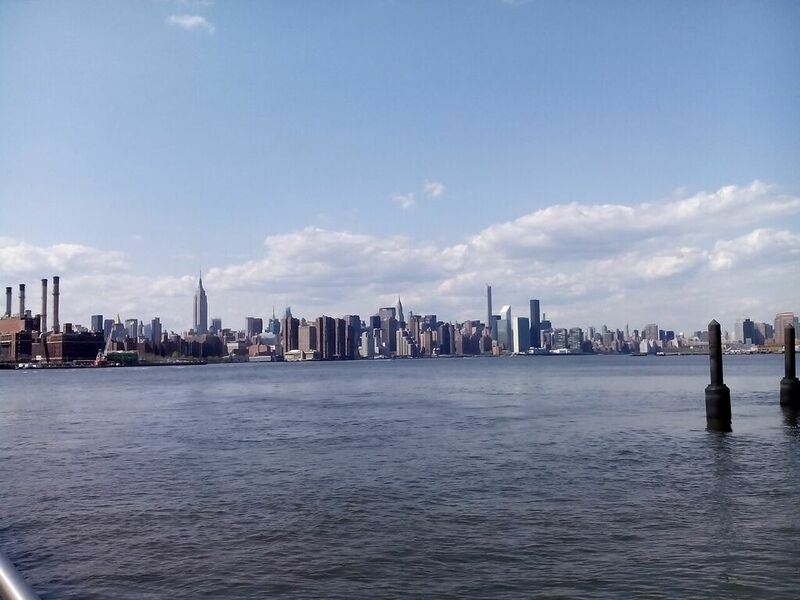 When I cycled to Brooklyn’s notoriously chic Williamsburg area, I spent a couple of enjoyable hours basking in the sun, looking across the East River towards a dazzling Manhattan skyline. The freedom of cycling allowed me some wonderful views from a bridge, too. Everyone knows, and I’ve covered this on ShinyShiny before, that the many bridges crossing the Thames offer some incredible views of London, so New York would be hard-pushed to beat that. But cycling across the East River towards Brooklyn, where I’m staying (either via Brooklyn Bridge or Williamsburg Bridge), I was rewarded with a stunning back glance at Manhattan. Something which didn’t escape my notice while I was exploring, however, was the lack of cycle parking facilities. 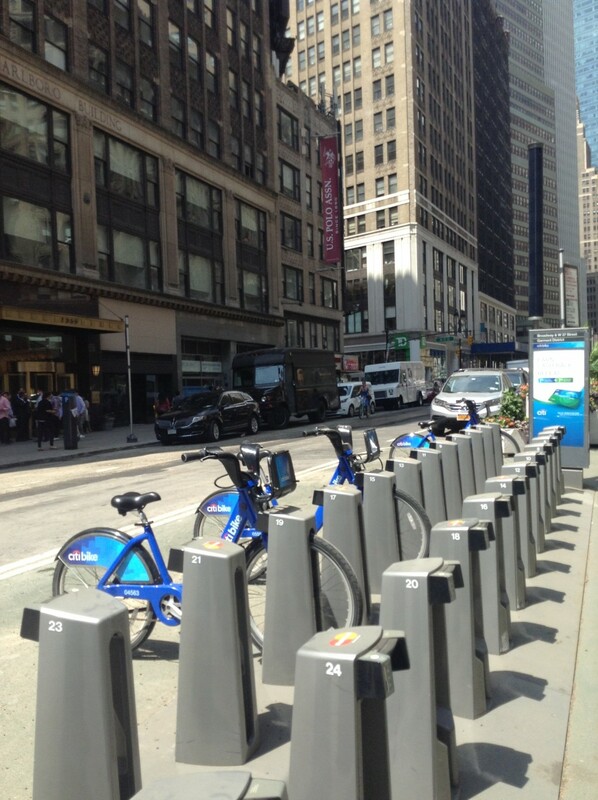 Although using a Citi Bike means I needn’t have worried about a lock, I was aware of a severe shortage of adequate spaces to lock a privately-owned bicycle, especially in Manhattan. 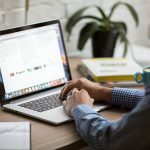 As one of the most densely populated areas in the world, I think it’s vital to provide space for cyclists – which is why steps like NYC’s Bicycle Access to Buildings Law, which forces commercial buildings to allow employers to bring their bicycles up to the office in freight lifts, are important. You can also take your (unfolded) bike on the NYC subway any time, whereas this is strictly limited on the London underground. 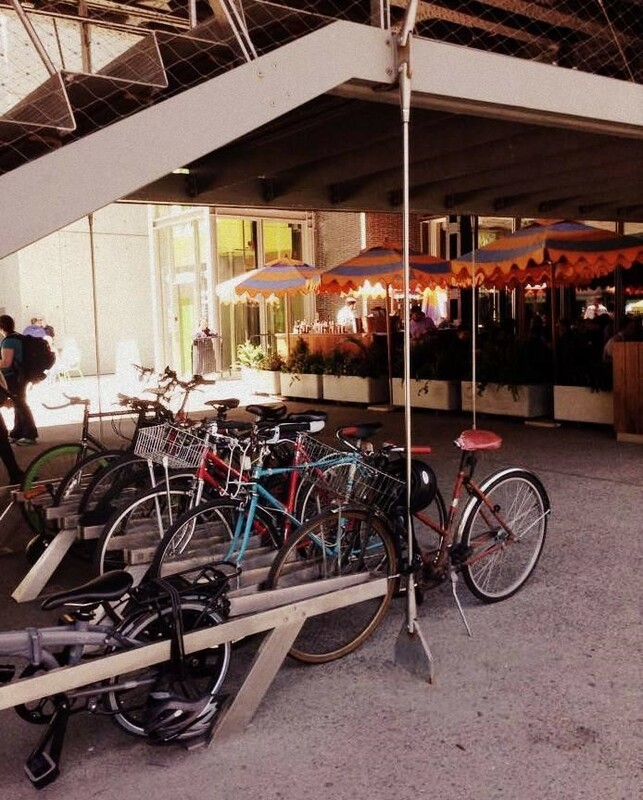 Bicycle racks at the southern entrance to the High Line in the Meatpacking District. 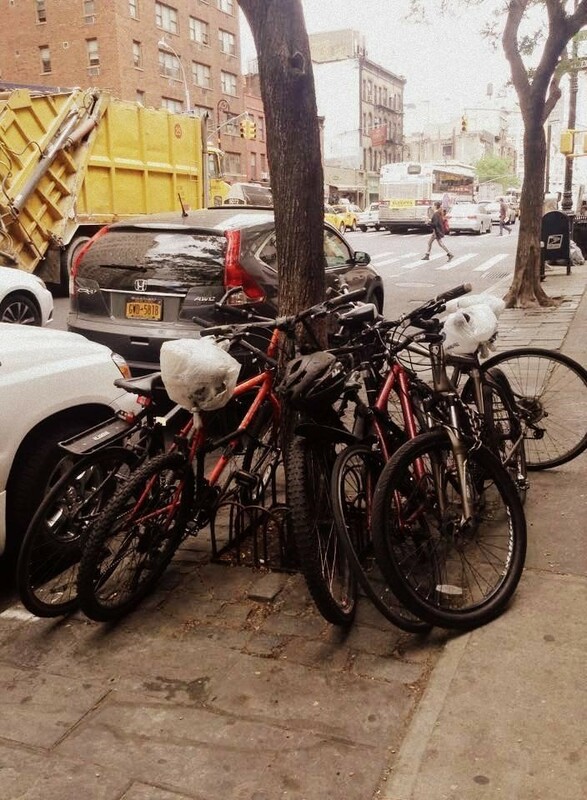 There aren’t that many designated spaces to safely lock your bicycle in Manhattan, so sights such as this are common. Sunday. My second weekend in New York, and I woke up with a nagging feeling of needing nature. 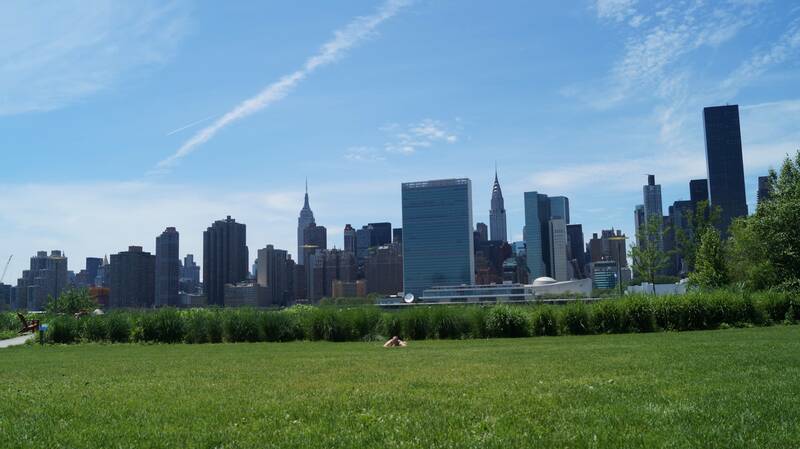 Given the frequency of encounters with beautiful green spaces in London, the obvious choice was Central Park, the stubbornly bright and vivacious patch in the grey quilt of Manhattan. It was the perfect day for a bike ride (and maybe even a picnic). 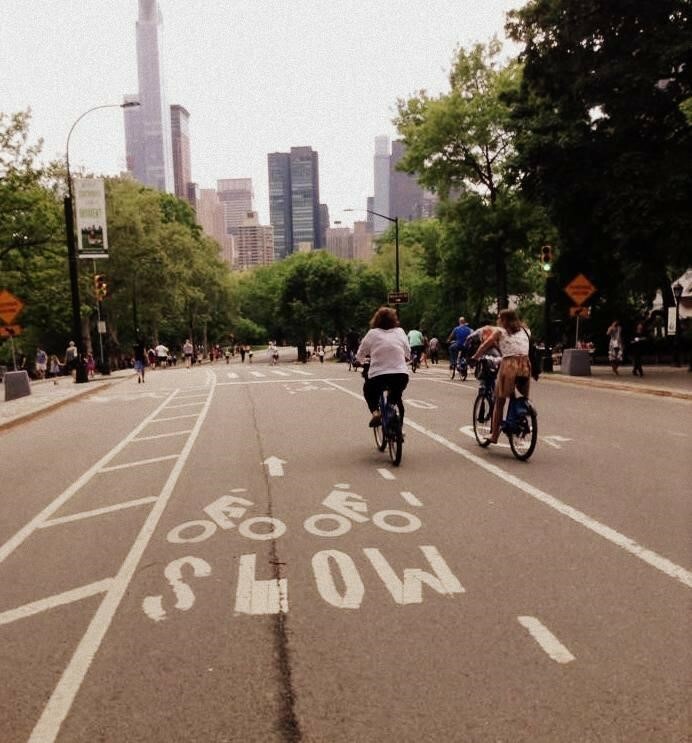 I visited Central Park via Fifth Avenue, and from a cyclist’s perspective, it caters well to anyone taking a gentle ride. From an egalitarian, urban point of view, it’s wonderful to see runners, cyclists, walkers and horse-drawn carts given equal status on the main path. 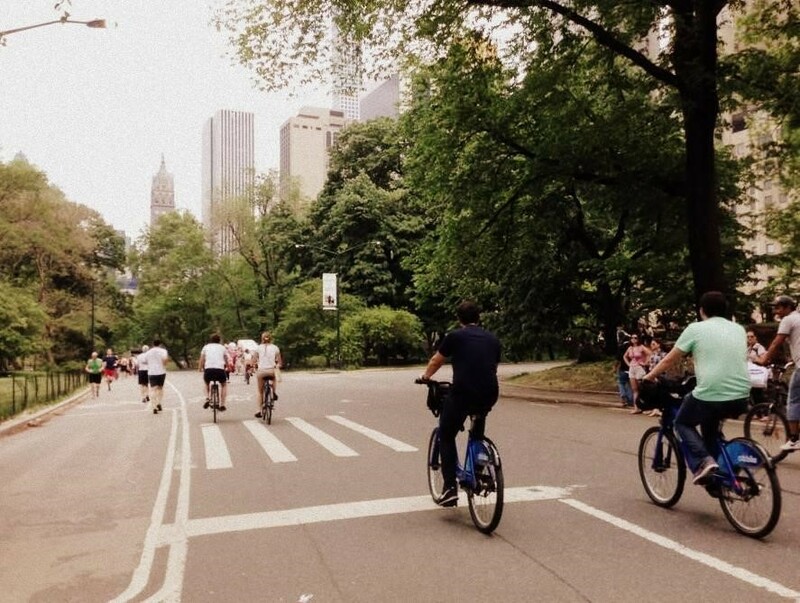 It’s akin to cruising Hyde Park’s cycle-friendly pathways, which means that sharing with dreamy pedestrians can be irritating – but this is New York’s crown jewel, the biggest green space in the whole metropolis; ensuring all-round accessibility is vital. I saw families, groups of friends, serious runners and relaxed joggers, horses trotting, toddlers on tricycles – it was strangely life-affirming to see these different pursuits so harmoniously executed. 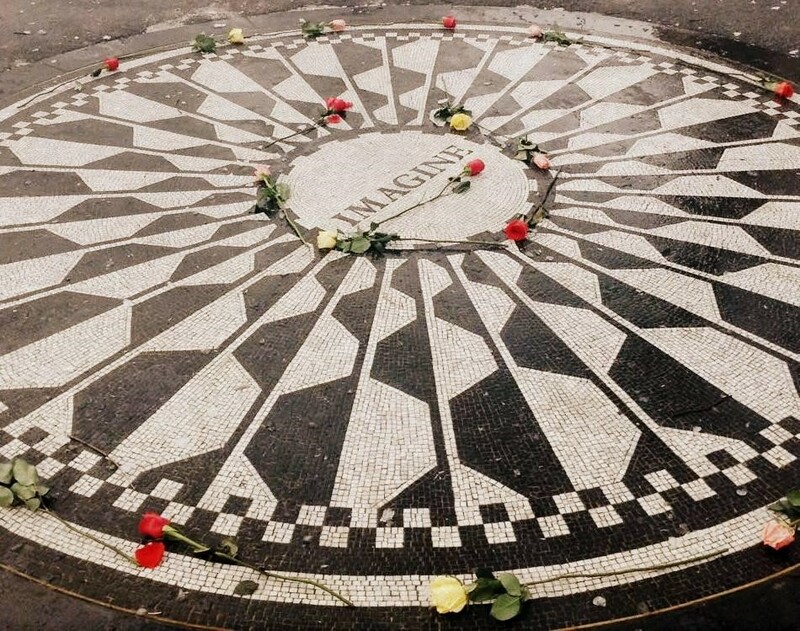 I spent the afternoon biking through the leafy grounds and experiencing a moment of intense reflection and sadness when paying homage to John Lennon at the Strawberry Fields memorial. The “Imagine” of his dreams almost seemed to merge with reality temporarily, as everybody in the park seemed so happy and carefree around me, “living life in peace … sharing all the world” (or just Central Park). 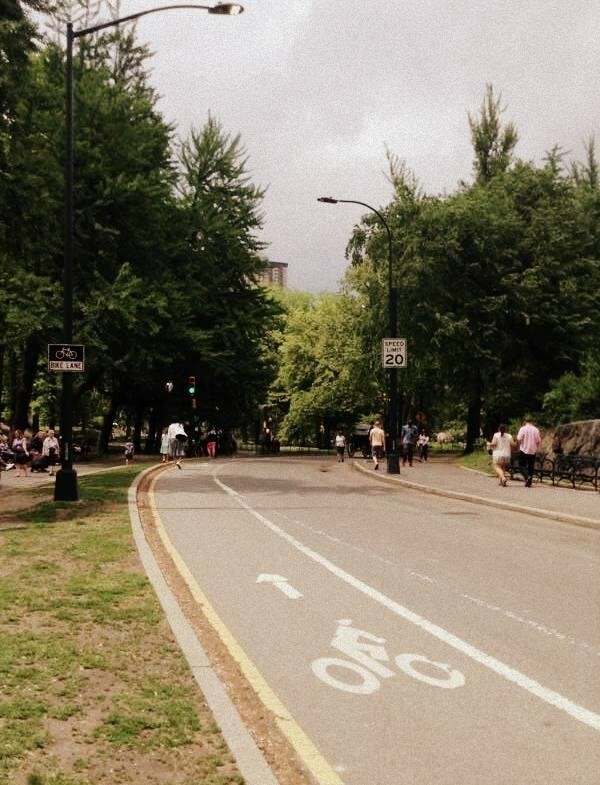 The main pathway in Central Park is shared by pedestrians, vehicles and cyclists alike. Citi Bike docks below Central Park are currently the furthest north in the city, and are some of the busiest. After my gorgeous afternoon in Central Park, it seemed nightmarish to have to tackle the busy roads again – but it was a necessary evil, as I wanted to see how Sunday traffic differed to that on weekdays. 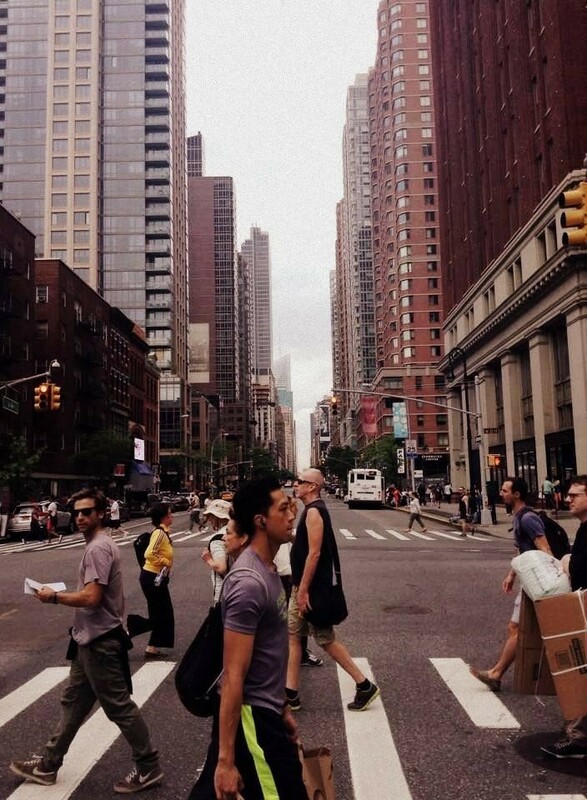 I approached the noisy Seventh Avenue with caution, expecting it to be pretty crazy. Given the relaxed attitude towards cycling that I mentioned earlier, it’s not surprising to see that most people don’t wear helmets. From my observations, it seems that those who do don protective headgear have a more ‘serious’ approach to cycling (ie. the helmet is generally worn with accompanying vest, streamline shorts and other high-tech cycle gear in a harmonious colour scheme). I’d say the number of those wearing helmets here is about the same as the amount of people who don’t wear them in London; perhaps that says something about differing general approaches to safety, no doubt stoked by a spate of terrible accidents on London’s streets 18 months ago. 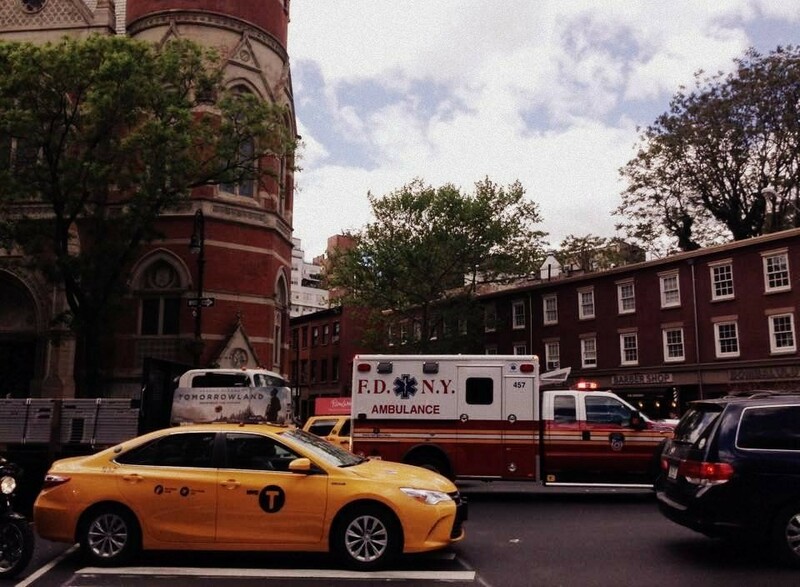 Unfortunately, accidents are a looming possibility on the streets of NYC, too. 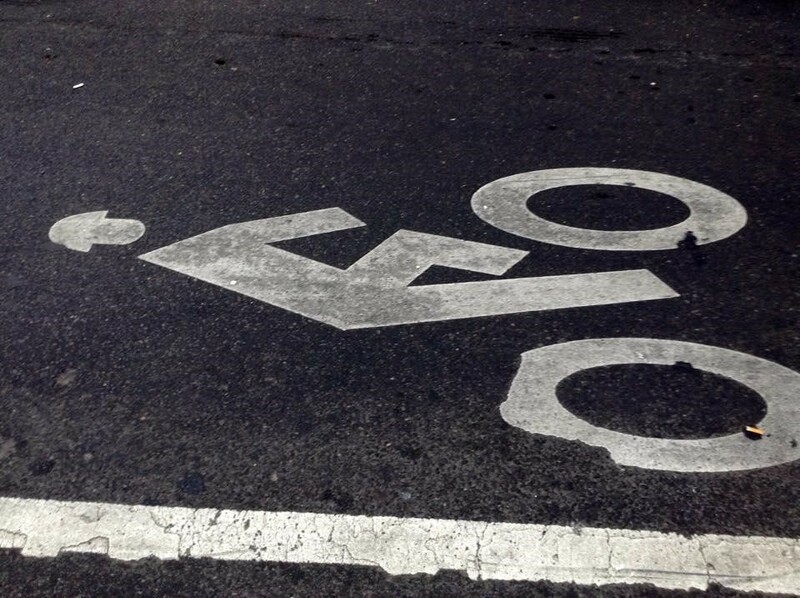 Between 2013-14, cycling deaths doubled in NYC to 17. By comparison, in London in 2013, 14 cyclists were killed – six of those in one deadly two-week period in November. The main vehicles to be wary of here are taxis, since there are so many of them; on large and busy roads, their drivers also tend to exercise their right to excessive manoeuvring. 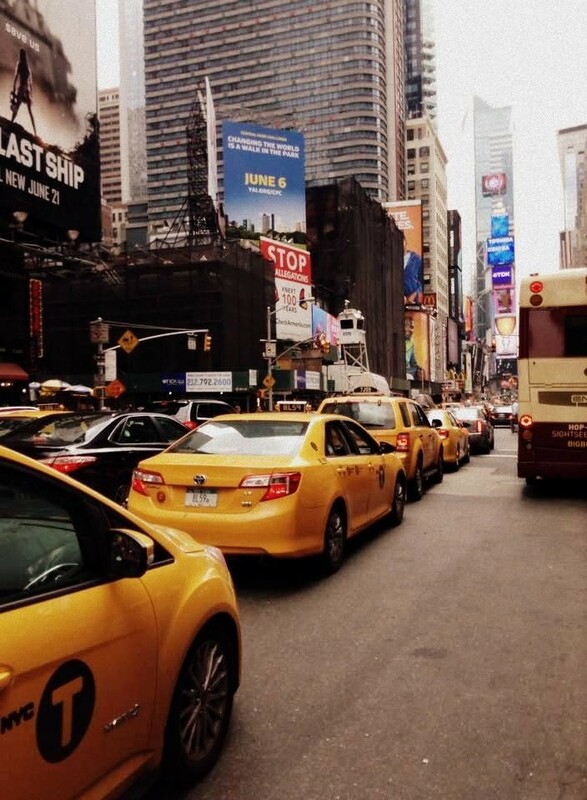 I was caught on Seventh Avenue in what I can only describe as a taxi crush on what was indeed an incredibly busy road. Cars cut across lanes; pedestrians ran into the road attempting to wave down a cab. At one gridlocked set of traffic lights, a similarly frustrated cyclist drawled at me, “traffic’s crazy on weekends. It’s all these out-of-towners.” He has a point. There was a tangible difference in the way drivers handled their vehicles. I have gritty admiration for city drivers; anyone that can navigate these busy streets, with all the random stops, starts and unpredictable turns, clearly has a level of control worthy of respect. I got home feeling windswept and knackered. Weekend or weekday, I’ve mostly felt that I’m in good company on the roads. Cyclists, though mostly young or middle-aged, are varied in appearance and purpose. They commute, they ride for fun, they cart food around. They’re male, female and everything in between. Yet throughout my time here, I have intentionally kept a gendered perspective on everything: male cyclists outnumber females three to one in NYC, and it is noticeable. I was particularly interested in any gender-based harassment I might receive (mostly to find out if what happens in this video also applies to women cyclists), but thankfully I had a happy, hassle-free experience on my bike. In London, where men are still 50% more likely to cycle to work than women and where female cyclists are arguably more susceptible to being killed by lorries, I’m used to the odd honk or road-rage-fuelled sexist comment by lorry-drivers – often with the effect of making me jump out of my skin. 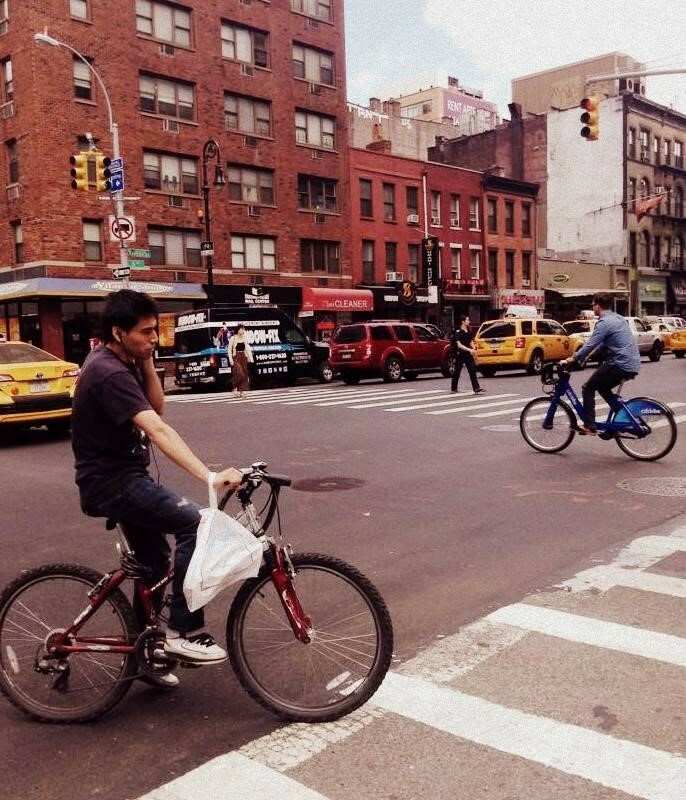 In NYC, I didn’t experience such things – although it can’t be called representative, as I was only cycling for three weeks. That said, I was on the receiving end of much more street harassment (cat-calling, unwanted conversation) as a pedestrian in New York, whereas in London this has only happened once or twice in almost four years of living there. And so I can report that without a doubt, cycling around New York is a truly rewarding experience. It might not have the progressive dazzle of that very first stroll through Times Square, nor the fun of riding atop a London double-decker bus, but I have concluded that it’s still the best way to travel here. The summer months are kind to New Yorkers; having endured a bitter winter, they’re rewarded with weeks of sunshine and balmy evenings, which make just the perfect conditions for hopping on and taking off on two wheels. The streets are radiant, the air is thick and loud: cycling slices through the noise and breathes life into the homogeneous Manhattan grid. I won’t make a definitive statement about which city is my favourite for cycling – London has my heart, but I’ve had a memorable time acquainting myself with New York by bike in these past few weeks, and I know it that much better for the quirks and complaints of cycling in heavy traffic. I haven’t merely trod these streets, but known them; I love this place, and my experience has already served to enhance my affection for this big, big town. As Tom Wolfe once said, “One belongs to New York instantly, one belongs to it as much in five minutes as in five years.” And I belong here now.